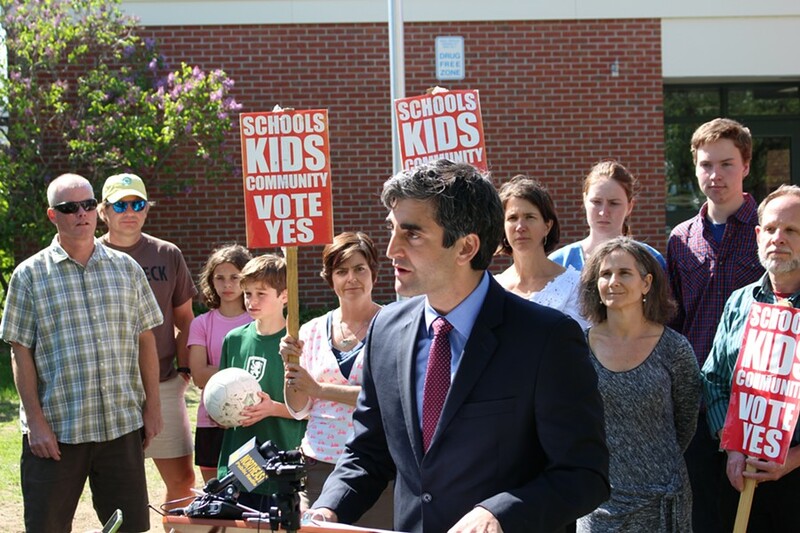 Mayor Miro Weinberger announces his support for the Burlington school budget proposal. Supporters of the Burlington school budget gained a key recruit Monday. On a sun-soaked afternoon, standing under blossoming trees and in front of a crowd of parents and students, Mayor Miro Weinberger announced he'll be voting for the budget. In just two weeks — on June 3 — Burlington residents will decide whether to support a $67.4 million budget, which comes with a 7.2 percent tax increase. Until now, Weinberger withheld his endorsement, announcing in April that he wouldn't support the budget unless Superintendent Jeanne Collins was removed from her post. Since Town Meeting Day, the school district has been embroiled in budget-related controversies, set off by the discovery that serious errors led to multi-million dollar deficits. On May 13, Weinberger got his way when the school board and Collins announced a settlement agreement that will send Collins packing on June 30, with $225,000 in severance pay. Now, one week later, he's decided to throw his weight behind the board's new budget. "My support of the budget is, in part, a reflection of my belief that it is important to support this Board’s ongoing effort to put our school system on more stable footing," Weinberger said in a prepared speech. "I am concerned," he continued, "that too many cuts too quickly and without a deliberate strategy will do considerable lasting damage to that system." If the budget fails, a default budget of $66.3 million with a 5 percent tax rate takes effect. The school board's finance committee is determining how to trim the budget to this figure. As of early Monday evening, no decisions had been made. A gathering of parents and students involved with Burlington Friends of Education, a group that advocates annually in support of the budget, joined the mayor at C.P. Smith Elementary School. Slightly dampening the "Kumbaya" spirit of Monday's press event was a rival event, held half an hour earlier by two school board members, Scot Shumski and Keith Pillsbury and city councilor Dave Hartnett. The group criticized Weinberger for not automatically mailing absentee ballots to everyone who requested them for the Town Meeting Day vote, arguing that it could "disenfranchise" roughly 700 voters who might be unaware that a second election is around the corner. Weinberger, when asked about it, said he was confident in his city attorney's interpretation that this isn't required under state election law.